Who could have known that meeting a of 32 people in a bay area garage on a rainy night in 1975 could spark a revolution that would eventually affect your every life. On March 5th, 1975 a group of hobbyist’s met in the Garage of Gordon French an engineer and did just that. That day, these folks converged in the garage of Gordon French and were very excited to see this new computer. 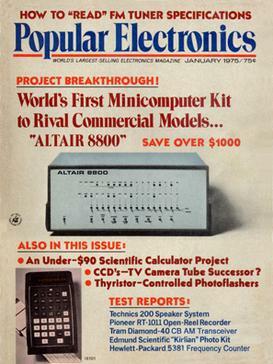 It had made the cover of Popular Electronics in January and everyone wanted to see what this new computer could do. At this time not all computers had a keyboard, the Altair 8800 just had a panel of switches. A keyboard technically could be used as an accessory, but you had to flip a series of switches until your fingers hurt to plug in enough instructions so that later on you could connect a keyboard. In these days to think that an individual could own a computer was a far off dream. It seemed silly even. These guys were enthusiasts, but it is hard to be an enthusiast in a market that the products don’t even exist yet. Each of them had a dream that at the very least they would be able to build a computer for their own use, something that at the time was very rare, because computers in the day were very large, but a few of these guys had been thinking about using a new type of integrated circuit to make computers much smaller. According to Lee Felsenstein, the serial number of the model they were looking at “was down around 8”. Suffice to say this was a very early model. After this first meeting, it was clear that the garage would be too small, so Len Shutek made arraignments for everyone to meet at SLAC every two weeks thereafter. It was this group of guys that brought us Apple Inc and maybe the phone in your very pocket. It is the group where Steve Jobs and Steve Wozniack would first sell their first Apple I computers as a kit, and where Steve Jobs thought maybe people want to purchase a finished computer ready to go in a box. A regular feature of the meeting was before the meeting folks would setup card tables in the lobby before the meeting and share with one another project they were working on. This is how Steve Wozniak would eventually show off his Apple I computer, which was not a finished project but more of a kit. That was the spark that eventually led to Steve Woz and Steve Jobs building an empire that exists to this day in the form of Apple Computer. 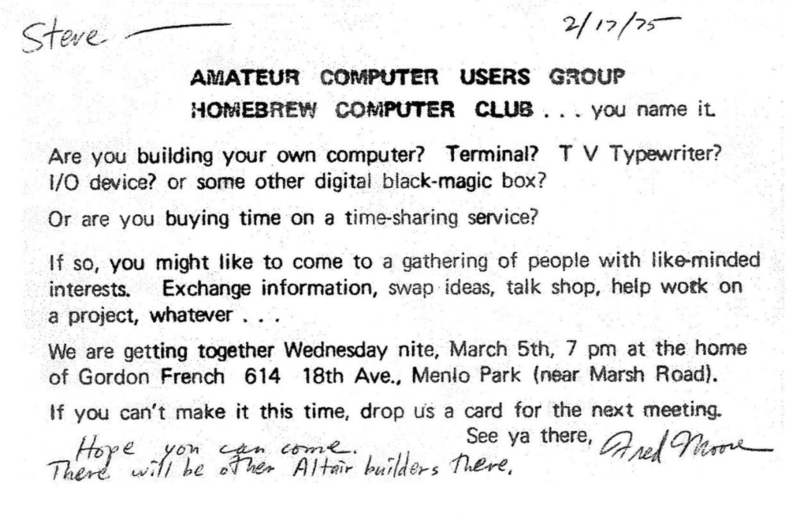 I recently read a great story which is titled Memoir of a Homebrew Computer Club Member which is not just a good read about the early days of the club, but of computing history itself. In the article Bob Lash one of the members of the Club notes “The excitement at Homebrew was electric, and during the period of ’74 to ’76 I constructed a working 12-bit micro -programmed minicomputer”. It certainly must have been exciting to be in this environment and in all of this excitement people were very open about sharing the hardware designs and software that they ran across. 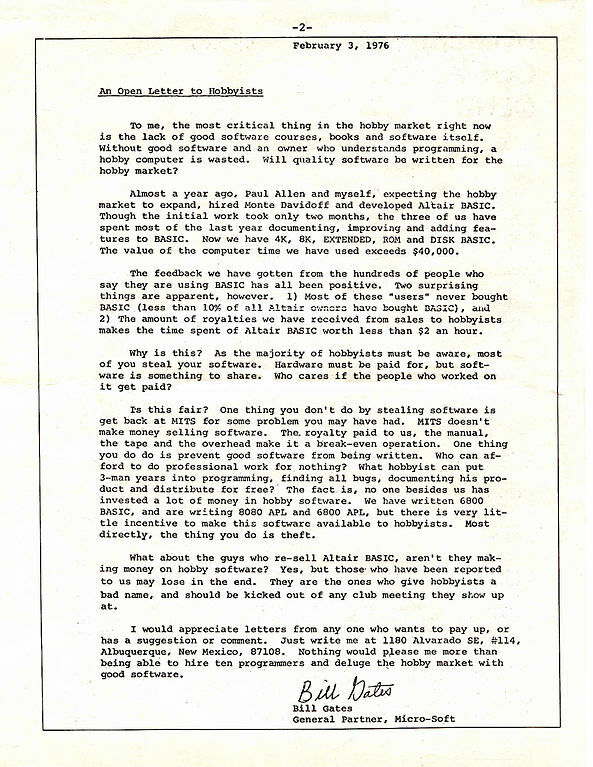 Eventually this resulted in another member of this ‘little computer club’, Bill Gates, to write an open letter to computer hobbyists noting that most of the folks who had the BASIC programming language for the ALTAIR never paid for it and it resulting in his work being worth less than $2 an hour. In the end I think Bill did okay. I think history has shown that we have the room and the acumen for a market where we can have both commercial software and what much later would become “Open Source” software, but clearly what was happening to Bill and his partner Paul Allen was theft. CNET did an article on Homebrew in 2015 and in that article Woz noted, “It was a meeting that grabbed my attention for life”. In the end it is hard to measure the commercial impact that this little group of like-minded individuals would have. They would meet every other week from March 6th to December of 1986, and as a result most of us now have a computer on our desks and a supercomputer in our pocket. Great article DWION! Interesting to see how our everyday computers…and their creators got started.